In an “unprecedented” situation, Syria’s declared chemical weapons will be destroyed not inside a country, but at sea, Sigrid Kaag, who is overseeing the operation for the U.N. and its chemical weapons body, told CNN’s Christiane Amanpour on Wednesday. “In an effort to find member states willing to assist in this process and basically lend their territory for the destruction process, no member states stepped forward,” Kaag said. As a result the U.N. is being forced to do it on board ships, on the high sea, in international territory. The Assad regime delivered the first batch of chemical weapons onto a Danish commercial ship on Tuesday, after missing a December 31 deadline. The chemicals left the Syrian port of Latakia today bound for Italy, where they will be transferred to a U.S.-owned cargo ship for destruction at sea. 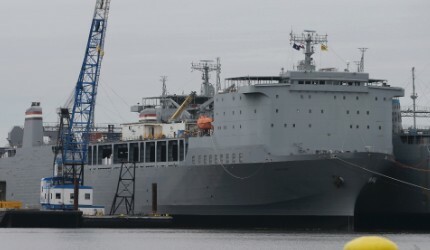 That U.S. ship, the MV Cape Ray, will arrive in the Mediterranean Sea between the January 23 and 26, she said. She would not comment on where exactly the destruction would take place. The only way to know if all the weapons have been destroyed, however, is what Syria voluntarily tells the U.N.
Everyone operates “on the basis of declared facilities and their chemical weapons program,” she said. “If there are any doubts, if member states [of the U.N.] feel there may be a gap or there may be an omission,” she explained, that country can take their claim to the OPCW or the Security Council. But what will be the long term effect on this to to the sea life? The process is called hydrolystate This is the method the United States uses to reduce the chemical weapons. They will be using chlorine and high temperatures to reduce the chemical weapons into a state that is not lethal. 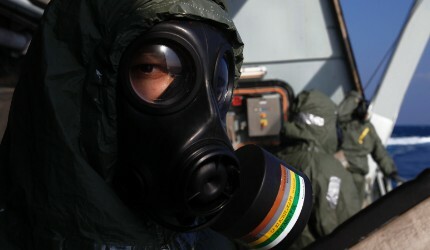 Once the chemical weapons is reduced to a less than lethal state it will be it will be NOT be dumped into the ocean. A German company has bided to further incinerate the industrial waste on land in an approved method. The poor sea...forever the dumping ground for man's stupidity. One day (probably not too far away) the seas of the world will be too polluted to work anymore...and that will be the end of us all. Mark my words. My proposal (to THEM) is to dispose that weapon into the Pacific ocean.The reason?Pacific is much bigger and contain much water than Mediterranean Sea so in the case of accident all that poison will be dissolved at bigger surface and volume.According to my calculations the best position is the halfway between the islands of Hawaii and west coast of United States.Many greetings from the Croatian Adriatic Sea (one of the most beautiful parts of the Mediterranean Sea). Brother the poisons will first be disintegrated into simpler and less dangerous components!!!! The reason why no country let UN to do that on their land is political and legal ones. But we do have to worry about worlds coal base power generation plants not to mention India and China! ivan the question is what if the wind blows ?! !...i dont think that U S and Europ will tolerate that. There seems to be a lack of understanding and knowledge by those responding to this thread. First, the chemical weapons are being destroyed at sea, but not in the sea. Second, chemical weapons were destroyed in Iraq after Gulf War I, and also at Johnson Atoll in the Pacific (where the US destroyed many weapons, as well as at a US Army Depot in Alabama and a few other places). 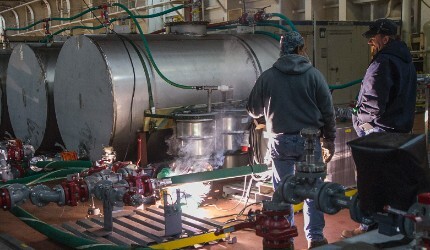 Third, incineration is used most commonly to render the chemicals harmless and it is done in a retention furnace (no smoke released until the process is over). Fourth, for nerve agents (organophosphates) UV light (aka sun light) will inactivate the compounds. If only man could live like the beasts, not looking back or sense apprehension about tomorrow, how this world would change for him. He would see all his estimates of worth change and devalue, and the question would come to mind: how much a fool have he has been, running around in circles, one generation after another, without unprejudiced clarification on what to do next. If only man could live like the beasts, not looking back or sense apprehension about tomorrow, how this world would change for him. He would see all his estimates of worth change and devalue, and the question would come to mind: how much a fool have I been, running around in circles, one generation after another, without unprejudiced clarification on what to do next. Interesting how regimes made out to be villains are the only ones destroying WMD's.. South Africa's Apartheid regime is the only one that developed the technology to build nuclear bombs (and actually did build a few!) then destroyed the technology (and the bombs). Syria's Assad has been instrumental in destroying their chemical weapons. Why is is that the democratically elected people's representatives in the US, Europe and elsewhere fail to follow this example? Does it mean that only dictators, and not ordinary people, wish to see a safer world? Because those that hang on to nuclear materials are seen as a pack of suckers. wont this affect aquatic habitat? How can it affect the acuatic habitat, given that the weapons will be incinerated at sea, but not dumped into the sea. I would worry much more about people in those vecinities, when the post-incineration smoke is released. This is why an ocean would be safer, given that the distances from people are much longer. However, the companies that are doing this job refuse to be far away from coastss, given the multiple trips to the shore needed and the economic cost associated. Which in my opinion calls for a careful monitoring of the winds when smoke is released, and for some lonely port for the transfer of those weapons, where there is no population at risk. The winds, optimally should blow to the sea. The part that went unmentioned is that there surely will be a grave risk that the ships will be attacked, in order to put as much as possible of these chemicals into the seawater. I need not go into who is likely to WANT such a disaster, because you already know. So what do they do? They identify the time and place, even the name of the ship – all of it with nice photos – which will help the attackers make their plans. Their success will depend, utterly, on their finding the ability to launch a major attack at sea. I have faith in their resourcefulness in such matters, sorry to say. All of this is going on under their faith that nobody on earth could possibly want to see a huge spill of the most deadly chemicals known to mankind. That faith is misplaced. I need not tell you who in the world has the kind of mindset that would eagerly cause such a spill, do I? If it can be done, those are the ones who WILL surely do it. This entire operation is highly vulnerable to attack. With HUGE amounts of profoundly deadly chemical weapons all concentrated into a very small, moving target, far away from any viable source of protection, it will be irresistible to the people who would be drooling to attack it. It should never have been publicized until it was all over with. This is one matter on which I fervently hope to be wrong.